You’re the first and best layer of defense in combating online threats, vulnerabilities, and associated risks that may result in cybercrime. Learning to properly detect and report these activities is the ultimate protection against cybercrime, including fraud. If you think that you’ve received a fraudulent email pretending to come from DocuSign, send the email as an attachment to [email protected] and immediately delete it. First and foremost, if you don’t recognize the sender of a DocuSign envelope and you’re uncertain of the authenticity of an email, look for the unique security code included in all DocuSign envelopes and found at the bottom of the notification email. If you don’t see this code, DO NOT click on any links or open any attachments within the email. Instead, go to www.docusign.com, and simply enter the unique security code provided. For more information, please review our Combating Phishing White Paper. Avoid fake links by accessing your documents directly from https://www.docusign.com using the unique security code found at the bottom of the DocuSign notification email. Fake emails may include a forged email address in the "From" field. This field is easily altered. If you don’t recognize the sender of a DocuSign envelope, contact the sender to verify the authenticity of the email. DocuSign email requests to sign a document never contain attachments of any kind. DO NOT open or click on attachments within an email requesting your signature. 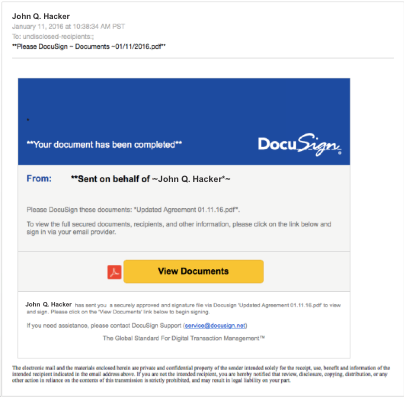 DocuSign emails only contain PDF attachments of completed documents after all parties have signed the document. Even then, pay close attention to the attachment to ensure it is a valid PDF file. DocuSign NEVER attaches zip files or executables. Many fake emails begin with a generic greeting like “Dear DocuSign Customer.” If you don’t see your name in the salutation, be suspicious and don’t click on any links or attachments. Many fake emails try to deceive you with the threat that your account is in jeopardy if you don’t provide immediate updates. They may also state that unauthorized transactions have occurred on your account or that DocuSign needs to update your account information immediately. Some fake emails are made to look like a website to get you to enter personal information. DocuSign never asks you for personal information, including login, ID, or password, via an email. Often the Web address of a phishing site looks correct but actually contains a common misspelling of the company name or a character or symbol before or after the company name, such as www.docusing.com instead of www.docusign.com. Look for tricks like substituting the number "1" for the letter "l" in a Web address or transposing consecutive letters of the brand, such as rea1estate.docusign.com instead of realestate.docusign.com. Your browser has ways of detecting certain types of malicious sites. Always heed these browser warnings, especially when they notify you that the site or certificate can’t be trusted. While no one is perfect, fake emails often contain misspellings, incorrect grammar, missing words, and gaps in logic. Mistakes like this help fraudsters avoid spam filters. DocuSign never uses a pop-up box in an email, because pop-ups aren’t secure. If you think that you’ve received a fraudulent email, send the email as an attachment to [email protected] and immediately delete it.